Spontaneously hypertensive rats (SHR) are one of the main animal models used for studying the effects of exercise on hypertension. Therefore, the determination of adequate intensity has been essential for secure and optimized exercise prescriptions concerning hypertensive subjects. This study aimed to identify the MLSS in SHR by using a treadmill test to improve the protocols and further prescriptions of exercise intensity. In order to carry out this determination, SHR (n = 10) animals (~17.5 weeks; 227.4 ± 29.3 g; 172.4 ± 8.1 mmHg systolic blood pressure) were divided into two groups (G1 n = 5; G2 n = 5). Rats underwent a test with three different velocities to determine the MLSS. The MLSS was considered as the highest effort intensity where the blood lactate did not vary more than 1 mmol.L-1 from the 10th to the 25th minute. The MLSS was reached at a velocity of 20 m.min-1 with 3.8 ± 0.5 mmol.L-1 of lactate for G1. Additionally, the results were validated in G2. However, when the test was applied at 25 m.min-1, there was no stabilization of BLC in G1 and G2. In this study it was possible to identify the MLSS in SHR rats, which is an excellent evaluation tool to control exercise intensity. These data are of considerable importance in studies using physical exercise as a means of research in hypertension and may lead to the intensity of exercise being prescribed more appropriately. Hypertension is considered one of the main risk factors for cardiovascular disease and may be closely associated with other pathologies such as diabetes and obesity . Several pathophysiologic factors may lead to hypertension, such as a stressful lifestyle related to increased sympathetic nervous system activity. Furthermore, high sodium consumption and hyper caloric diets may also lead to hypertension and to diabetes mellitus, obesity and perturbation of the renin-angiotensin-aldosterone system, impairing vascular tone and increasing endothelial dysfunction . Therefore, independently of hypertension pathogenesis, its chronic maintenance is itself a strong factor of cardiovascular diseases, leading to high death rates worldwide . Along with dietary and pharmacological treatment, chronic exercise stimulus has been recommended as an alternative and effective way to prevent and treat hypertension, since it reduces resting blood pressure rates . As well as chronic stimulus, blood pressure (BP) is also decreased at resting rates after one single session of exercise, a process known as post exercise hypotension (PEH), which started to attract clinical attention at the beginning of the 1980′s . The PEH phenomenon has been widely researched under the influence of aerobic exercise and to a lesser extent under resistance training . However, there are concerns about the adequate intensity and duration of exercise that may lead to a potential hypotension effect. The determination of adequate intensity is therefore essential for secure and optimized exercise prescriptions involving hypertensive subjects . To this end, animal models are often used in exercise research, especially to establish adequate training exercise intensities. Spontaneously hypertensive rats (SHRs) are one of the main animal models used to verify the positive effects of exercise in the hypertensive phenotype, as well as to understand the biologic dysfunctions caused by this pathology . Nevertheless, there is a lack of methodological data that serve to establish adequate exercise intensity in hypertensive animal models. Blood lactate concentration (BLC) is a valuable tool in determining the intensity of exercise and is commonly accepted as a performance index . Therefore, the maximal lactate steady state (MLSS) is considered the gold standard in assessing aerobic capacity, since it is based on the identification of the greatest intensity of exercise in which there is no increase in lactate production . This represents the time when the production/removal of lactate is in equilibrium . The MLSS has been identified in different animal models [10, 11], such as in rats swimming or using a treadmill in sedentary, trained, adult and old animals [12–14]. However, until now, the MLSS protocol has not been identified in hypertensive animal models such as SHR. Consequently, this study aims to identify the MLSS during treadmill exercise in hypertensive rats in order to further improve protocols, and prescription of exercise intensity training for hypertensive subjects. Moreover, the relationship between aerobic power and MLSS in SHR was also verified. Ten female spontaneously hypertensive rats (~17.5 weeks; 227.4 ± 29.3 g; 172.4 ± 8.1 mmHg systolic blood pressure) were used. These isogenic animals were obtained from the bioterium of the Federal University of São Paulo, Brazil. Water and food were provided ad libitum, and the animals were kept in a 12:12 h dark–light cycle in a room at 23 ± 2°C. The study was approved by the ethics committee on animal use of the University of Brasilia, Brazil. All procedures were in accordance with the Brazillian College of Animal Experimentation (COBEA) . Only animals showing physical fitness in treadmill exercise were chosen (n = 10). All animals underwent treadmill (Li 870, Letica Scientific Instruments, Barcelona, Spain) adaptation according to Contarteze et al. . After the adaptation period (5 days/week for three weeks, where environmental adaptation, duration and velocity were progressively increased), a group of rats (G1, n = 5) underwent a test at three different velocities to determine the MLSS (15 m.min-1, 20 m.min-1 and 25 m.min-1). The velocities were set randomly, and the tests were carried out with a 48 h interval between them. The tests lasted for 25 min of continuous exercise (0% graded) or until animal exhaustion. Capillary blood was collected every 5 min from the distal portion of the tail of animals for BLC analysis. This protocol has been previously applied in Wistar rats . The MLSS was considered as the highest intensity of effort where the blood lactate did not vary more than 1 mmol.L-1 from the 10th to the 25th min . Additionally, a maximal incremental test (IT) was performed with 0% graded exercise with increments of 3 m.min-1 every 3 min , starting at 8 m.min-1 until animal exhaustion. In order to verify the reliability of results obtained in G1, the same procedures were applied to an extra group of SHRs (G2) (n = 5). From a small incision in the distal tail portion, 10 μL of blood was collected in capillaries, rapidly deposited in microtubes (0.6 mL) containing 20 μL of 1% sodium fluoride and stored at −20°C for further biochemical analysis. The electro-enzymatic method from YSI Sports (Yellow Springs, OH, USA) was utilized for BLC analyses . All analyzed data were normally distributed and a Kolmogorov-Smirnov test was applied to verify the normality of data present (p > 0.10). The data are presented as mean ± SD, and statistical analyses consisted of one-way ANOVA for repeated measures with Bonferroni post-hoc test. The level of significance was set at p < 0.05. The G1 results showed stabilization of BLC at 15 m.min-1. Otherwise, when applied at 20 m.min-1, stabilization of BLC occurred contrary to the test performed at 25 m.min-1, which showed an increase of BLC. Therefore, when the test was applied at 20 m.min-1, it was possible to identify the MLSS, as shown in Figure 1. Aiming to confirm the data obtained from G1, the same procedures were applied to G2. Similar results were obtained from G2, and stabilization of BLC occurred at the velocity of 15 m.min-1 and 20 m.min-1. However, when the velocity of 25 m.min-1 was applied, the BLC did not show stable behavior. Thus, the MLSS results found in G1 and G2 (20 m.min-1) showed no statistical differences (p > 0.05) (Table 1). Therefore, the MLSS was found at the velocity of 20 m.min-1 in both groups. By the incremental test (IT), animals showed similar results, reaching maximum velocity of 27 ± 2.7 m.min-1 for G1 and 26.5 ± 2.2 m.min-1 for G2 (P > 0.05). The MLSS identified in this study for SHRs represents approximately ~75% of the maximum velocity achieved during the incremental test. Blood lactate concentration (mean ± SD) during the identification of the MLSS in treadmill running test at 15 m.min -1 , 20 m.min -1 and 25 m.min -1 velocities in G1. Vertical bars correspond to standard deviation. ANOVA showed no statistically significant differences (G1 vs. G2) (P > 0.05). The present study aimed to identify the MLSS in rats of the SHR strain, an important animal model in studies involving the understanding of hypertension. As far as we know, this is the first MLSS identification in SHR animals, setting their aerobic capacity in a treadmill device at the velocity of 20 m.min-1 in G1 with blood lactate concentration of 3.8 ± 0.3 mmol.L-1. These data reinforce the role of proper exercise intensity for attenuating physiological dysfunctions caused by hypertension. The increasing number of studies related to the benefits of exercise for hypertensive phenotype led exercise to be widely recommended as a non-pharmacological treatment  for hypertension attenuation. However, the precise prescription of exercise should be taken into consideration, especially regarding the intensity of exercise. Considering that one of the benefits of exercise for hypertensive subjects is the PEH effect [3, 18], and since exercise intensity seems to influence the magnitude of the PEH effect [19, 20] it is particularly important to establish the appropriate intensity at which the exercise is carried out, With this in mind, Lee et al. showed a PEH in SHR (15 m.min-1 for 20 min), and there are several other studies that showed substantial benefits of exercise in SHR model [22–24]. Furthermore, it has been observed that hypertensive myocardium improved after 12 weeks of running (60 min, 5 days/week) at the velocity of 20–25 m.min-1, which corresponds to exercise performed both above and at the MLSS intensity determined by this study. The MLSS is commonly considered the gold standard for aerobic capacity determination. Nevertheless, other methods can also be applied to identify the anaerobic threshold, which similarly could be used for aerobic capacity determination . In an attempt to determine aerobic capacity in Wistar rats, Contarteze et al. found an intensity corresponding to lactate threshold at 20 m.min-1 with a BLC of 3.8 ± 0.1 mmol.L-1. 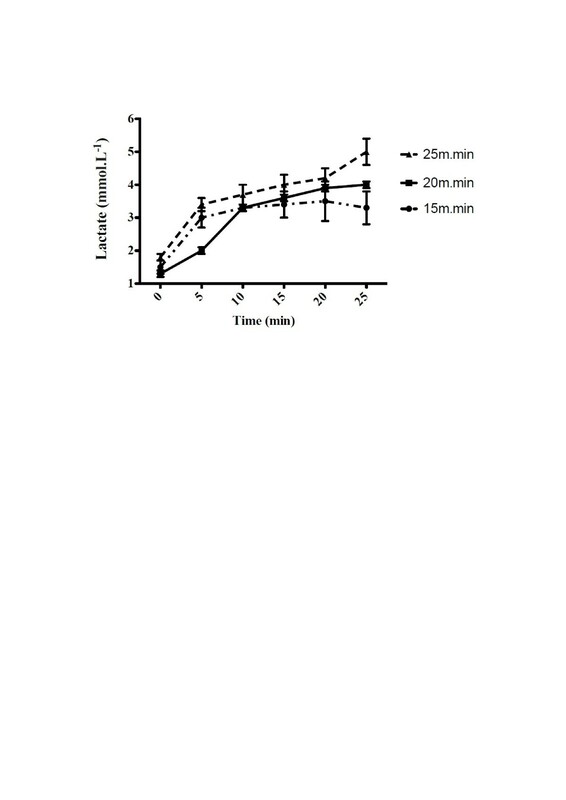 Interestingly, in our study we also found the aerobic capacity at 20 m.min-1 with a BLC of 3.8 ± 0.3 mmol.L-1 using the gold standard method (MLSS) (Figure 1). Although Wistars and SHRs exhibit the same aerobic capacity, Ceroni et al., showed that SHR that underwent an IT revealed higher performance (aerobic power) when compared to Wistar rats. IT is widely used to prescribe the intensity of exercise , since it is easier to apply than the procedure for determining the MLSS, which requires more time to perform than the anaerobic threshold determination by ITs. In Wistar rats, this could be justified by the fact that usually the lactate threshold identified by an IT does not differ from MLSS . However, the MLSS for determination of the aerobic capacity had not yet been identified in the SHR to date, and this study is the first to identify this MLSS in SHR during treadmill running. Additionally, the MLSS speed in this study represents ~75% of aerobic power determined by IT, which makes it clear that hypertensive rats exhibit excellent aerobic capacity, as previously observed by Ceroni et al. (2009). However, it is important to remember that there are several study limitations. Among them, anaerobic threshold and VO2max were not identified. To this end, further studies must be performed in order to identify these variables and confirm our findings. Such data could improve the training prescription standards in SHR animal model. The results of this study provide an appropriate way to determine the intensity of physical exercise in hypertensive rats, so that future studies can use the MLSS as a tool to evaluate aerobic capacity, appropriate physical training intensity prescription and validate other protocols of physical assessment. However, although this study was the first to identify the MLSS in SHR on a treadmill, the lactate threshold was not identified by IT. Since the SHR is an important model for studying diseases such as arterial hypertension, the use of MLSS is recommended in future studies, in order to ensure more accurate results with respect to exercise. This work was supported by UCB, FAPDF, CAPES and CNPq. JAA; carried out the study design, performed the animal training and statistical analysis and drafted the manuscript. BAP; carried out the study design, performed the animal training and drafted the manuscript. CPCG; carried out the study design, performed the animal training and drafted the manuscript. RWP; carried out the study design and drafted the manuscript. OLF; carried out the study design and revised the manuscript. All authors read and approved the final manuscript.